Planned for launch in 2007, the European Space Agency's Herschel Space Observatory (formerly called FIRST – Far Infra Red and Submillimeter Telescope) will collect the light from distant and poorly known objects, such as newborn galaxies thousands of millions of light-years away. Bigger than any of its predecessors at approximately 7 meters high and 4.3 meters wide (thanks to the pioneering use of silicon carbide, an exceptional material whose mecathermal properties allow the manufacture of ultra lightweight but very large instruments – the Herschel mirror, at 3.5 m, will weigh only 300 kg, as opposed to the 1.5 tons required with standard technology), it will be the first space observatory covering the full far-infrared and submillimeter waveband. It will be located 1.5 million kilometers away from Earth, farther than any previous space telescope. The instruments will have to be cooled down to below -271°C by a cryostat full of superfluid liquid helium. The Herschel instruments cover the far infrared to submillimeter range of the spectrum (from 80 to 670 microns). 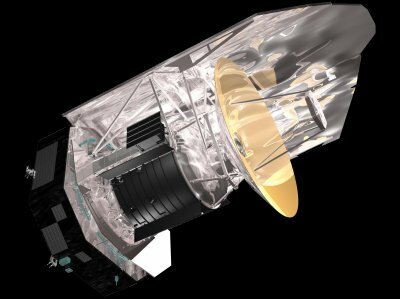 Astrium has been awarded the European Space Agency contract to provide the complete integrated payload module for Herschel, including the all-silicon carbide space telescope mirror and the superfluid liquid helium cryostat cooler necessary to maintain the telescope optics at a temperature of –271°C. Herschel ended its mission on 29. April 2013, when it ran out of Helium coolant.